Question of the Day: Do you judge books by their covers? Back when Life Your Way was Organizing Your Way, we used to do a weekly “Question of the Day” feature, and I thought it would be fun to bring it back from time to time! 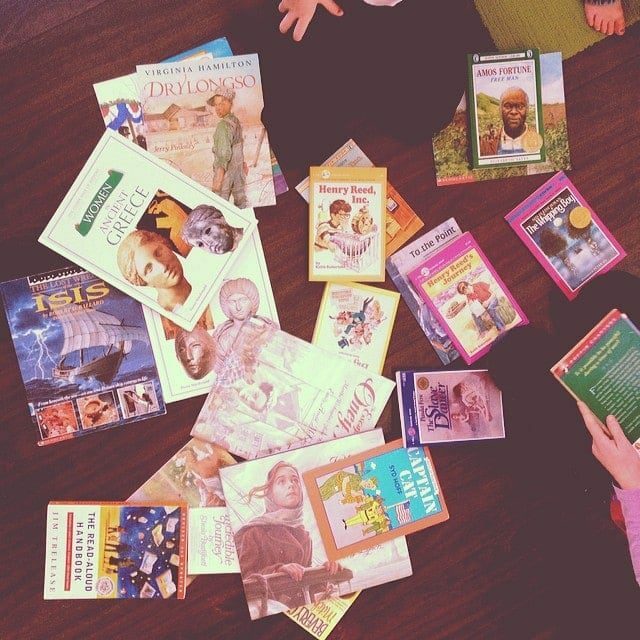 Last night I bought books for our upcoming school year, which is my very, very favorite part of homeschooling. Don’t get me wrong: I’d have books even if we weren’t homeschooling, but this way I can totally justify the purchase of a ton of books as part of my curriculum budget! Anyway, in years past I’ve spent hours and hours putting together the perfect list of books to go with our curriculum. This year, however, I’m feeling stretched from all sides, and I decided to breeze through the unofficial booklist from Brandy at Half-a-Hundred Acre Woods and select a few books for each topic without worrying about evaluating all of the options. About halfway through the process last night, I realized that I was totally judging books by their covers. I want pretty, interesting books, not boring, stodgy-looking ones, even if the information in the “ugly” books is better! I probably made some poor decisions with that as my criteria, but it did make the process a lot faster, and I ended the night with an order for 100 new-to-us books for our library! So today I want to know…do you judge books by their covers? Do you do it more for children’s books or books for yourself? Fiction or nonfiction? Have you ever discovered an ugly book you love that you originally overlooked because of its cover? Previous PostQuestion of the Day: Do You Have a Reading Goal for 2012? Next PostQuestion of the Day: What’s most important to you in a home? I totally do the same thing. I’m in the same boat with book lists for this year (as a brand new homeschooler, even!) and I was complaining to my hubby that I don’t have time to research all these books, so I’m just going to have to do a quick look and decide. I do it for myself, too, but not quite as much. I expect to read “boring” books (you know, educational), but I think my kids need that extra bit of interest by getting excited about how they look. Yes I do that too! I am sure I have overlooked plenty of good books in the past because the covers were uninteresting. And I know I have picked up some that looked REALLY GOOD based on the cover but weren’t 🙂 I probably do this more with books for me than with books for my daughter. I hate to say it, but I do too. Even if it is a book that was recommended to me and I see the cover is boring or not eye catching, I immediately give myself an out by thinking I’ll just read the first chapter or so that way I can say that I least tried reading it. More often than not, once I start reading the book I completely forget about the cover! I definitely do for myself, my son, and my classroom. There are many books I likely wouldn’t have picked up and read because of this unless there was a reason I had to read it or if our librarian at my school strongly encouraged me to read it. I’ve noticed some publishers have updated the covers throughout the years and I think that’s been helpful. One of the best books I nearly missed out on is Belle Teal by Ann M. Martin. It was a required summer reading for fifth grade when I joined a new school as a teacher. I’d had this book in my classroom collection for years, but just didn’t find the cover appealing (nor did my students as it didn’t look like the book had ever been touched). I was soooo glad I read it and shared my story about judging it with my students. Oh, I do, too! I think publishers are more aware of this now and are working at making covers eye-catching for this very reason. Have fun choosing all your books! mmm619, now you have my curiosity up; which version did you have that you didn’t like the cover? Oh, I do. If the illustrations are not great. The book doesn’t come home. I don’t care how great the story is. I think I do half the time. It depends on the book…if I know what the story is about and know that I want to read it, I will get it regardless, but other times, if it looks boring, I’m not as motivated to pick it up. If I am not looking for something specific-ish, I will judge by covers. When I’m in the thrift store, I tend to look for books I read as a kid that I think my daughter will like. In the Scholastic catalog, I stick to genres and subjects regardless of covers.